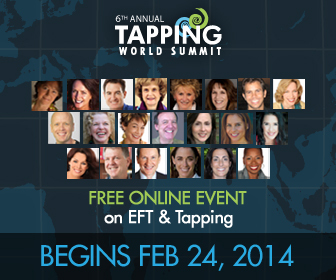 Listening to the 2014 Tapping world summit has reinforced the notion that everything is connected. Your body, mind, and soul are all one, and we are all one with everybody else. Whether you tap on weight loss, or finances, anger, anxiety, or pain, you will get results not only in that area, but your life will improve in all areas. This was all about burnout. Many people are burnout and do not realize it. I came to the realization that I am physically and emtionally burnout. Jessica Ortner shared her own struggle with weight loss and how the weight came off once she started tapping on it. She shares the reason tapping works on weight loss is because tapping lowers level or cortisol which helps with weight loss and the fat in the abdomen. Stress has a huge impact in our life, including weight loss. Stress can increase level of cortisol, But by tapping you can bring them down again. In addition by tapping we can change our behaviour. We do eat sometimes out of pleasure and not because we are hungry. For example mothers eat out of pleasure when the kids go to sleep. They enjoy being alone and is a way of relaxing. Tapping you can modify that behaviour, calm your anxiety, give you the peace you need, instead of resourcing to food. The first step is to break the pattern of overeating. So for that you need some triggers, like the scale, mirror, or new years or birthday resolutions. Cravings are to satisfy an emotional need. Once you tap, you can choose to satisfy that craving with food or to continue tapping to satisfy your emotional needs. Jessica stress that this is a journey and that there are layers that you need to peel off. You will not tap once and lose the weight. You need to uncover layers of issues that are bothering you. It could be financial, relationships, anxiety, or any emotional issue. Once you uncover those, and keep peeling off, you will end up not only losing weight but solving other issues you may have. It is all about being confident with your body image and loving yourself. What a powerful session this was. You probably hear me say that about every session. since I cannot say one or the other one was more powerful. The point here is that you could start tapping on pain, and end up releasing some emotional issues or financial issues that you were not even considering. This was all about burnout, and many people are burnout and do not realize it. I came to the realization that I am physically and emtionally burnout. Burnout is more severe than just plain overwhelmed. You may have physical or emotional symptoms. You could feel depressed, or just tired. We live in a time where we just push and push, without taking time to relax, and just be. So we end up exhasuted or burnout. Carol tapped on being burnout or exhasuted. She also tappned on feeling guilty when we say no. It is badly seen when we say no, but we need to tae care of ourselves before we can take care of anyone else. This applies to physical and emotional needs. Carol also tapped on not feeling valuable when you are not busy al the time and she did another round of feeling powerless but being able to choose your reaction. She ended the interview with a round of tapping on I feel under pressure to do so much. Carol says if you do not have the time or if you feel overwhelemd start tapping 5 mnutes a day and then extend the time as you go. . I love Margaret Lynch Tapping sessions, and this one was no different. The first issue is that many people are in denial about their debt problem. They know they have a debt, but they do not really want to look at it. The second issue is the shame that the person feels about having a debt. The shame can weigh you down, attracting more debt. The third issue is the stress and anxiety that accompanies any debt situation. When you feel anxiety or stress you cannot think clearly, therefore you cannot think of a solution. During the session Margaret made us do an exercise to acknowledge our debt, and get rid of the shame. Then she did a couple of very powerful tapping rounds about money and financial situation. Then she did more rounds of tapping to ask for help The interview ended with an empowering round of tapping. Great session like all other sessions of the summit. As said before all sessions were very powerful and this was as powerful as the other ones. Pamela Bruner tells as that money is a magnifier. That if we want to be spiritual people, it iwoudl be better if we have money. With money we can help so many more people. Why are you afraid of having money? Pamela stressed the idea that money is a way in which the world can appreciate your gifts. Powerful concept. She tapped on thsi concept. Money will magnify who you are, so if you are a spiritual person, money will make you more spiritual. If you are a bad person, money may affect you in a negative way. You need to tap whenever you feel anxious. Pamela says you need to invest in yourself, in your education. That can never be lost So invest in yoruself. She also gave us six powerful tips to manage money, and she did some tapping around it. Powerful session which I will listen to again. Mary Ayers tells us that 40 million people in the USA alone have problem with anxierty. The anxiety can be caused by financial, relationship, or health problems. More than one third of people do not report their anxiety problems. The cost of anxiety as a nation is over 65 million dollars. The anxiety could be generic, or due to specific cause. It coudl be due to genetics or it coudl be learned anxiety. Once you are anxious, your body memorizes your anxiety state, and then you enter a loop in which you are always anxious. EFT or tapping can break that loop. EFT also stimulates the endorphines, which makes us relax.. Once you are mre relaxed you coudl improve your thoughts to get you out of the anxiety loop. When tapping, be aware of your body. Where do you feel the anxiety, in your stomach, neck, heart, where s it? Start tapping using your body, and how it feels. Talk about an event that made you anxious. When you talk about it, you can shift your emotions and how you see it. There are two words that are very important: "What if" You can just tap repeating "What if" and bring the level of anxiety down. Mary recommends to tap as ften as you can.. Do not wait till you are at level 9 o r10. Tap aat least three times a day and as often as you can. If you are in public, Mary suggests you rub the inside of your wrist. This will have the same efefct as tapping. Other points you coudl tap in public are your chin or collar bone. It is not uncommon that peopel that do not know about EFT still tap on these points . This was a very powerful session that can be used by anyone as everyone wgets anxious at one point. I do not get tired of saying it. This was another powerful interview. We are taught that anger is an unacceptable emotion and therefore, we suppress it. We were never taught how to deal with anger As a result we are bad managers of anger. The truth is that feeling anger is acceptable, whilst showing anger ina violent manner, that may hurt others is unacceptable. Carol suggests that you write what you are angry about. Once you are written it down, then you already have yoru tapping script. This is easy as most people give up on tapping when they do not know what to say. Once you start tapping on anger, your system will open energetically. When anger gets repressed it will manifest in other ways, like addictions. The energy of anger needs to be channellled in one way or another, and addiction is one way of channelling it, but it is not the best way. It is advisable to connect with your anger, your repressed anger or whenever you feel angry. When you feel angry, first feel your anger without voicing it. Instead journal and tap on it until you feel more stable. Then you will be able to voice your anger from a place of more balance. Letting go of control is a way of getting rid of anger. You cannot control everything. EFT Tapping or Emotional Freedom Technique is similar to acupunture without needles. It is the mind body tool and with the proper guidance, it can easily performed by yourself whenever in need of.